Recently the New York Times highlighted the story of a US soldier who returned home from war and then died from his healthcare. It was tragic for him, and it happens all the time. The soldier suffered from Multiple Pharmaceutical Toxicity – what happens when the multiple drugs prescribed by physicians interact in patients. Many of these interactions have never been tested in clinical trials or regulated by the FDA. There are no limits to the number of prescription medications one person can take. And therefore, as in the case of US Solider Anthony Mena, no limit to the pill combinations; thus the multiple synthetic chemical interactions of different medications are essentially tested on you and me. And, folks, it does not look good. More than 106,000 people die annually from prescription medications. And this number is conservative—not including the millions that have permanent disabilities from toxicity, harmful pill interactions and medication side-effects. Put the numbers together, and it gets ugly. 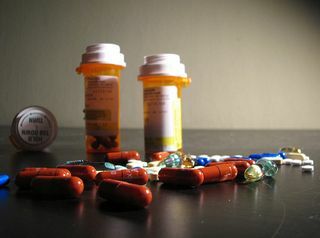 Twenty-five percent of our nation’s children are on chronic medications. Six and half million kids are on the notorious anti-psychotic medications. out of every five dollars is spent on pharmaceutical medications. And, it is not making us healthier, but sicker. 1) Ditch the frequent shopper pharmacy cards and start being a frequent flyer in health stores. The answer is nutritional supplements, fresh unprocessed vegetables, vitamin and antioxidant rich diets, natural sunlight, exercise and a doctor that knows his herbs. 2) Currently, Americans pay five times more than consumers in other countries for their medications. Encourage state and federal leaders to promote “free trade” practices to the undue current medical monopoly in the United States. Start petitioning your legistalors: make them work for us. 3) Most important, the ultimate answer to better medical practices and healthier citizens begins from incorporating humanistic practices into our current medical system. Research from the University of Michigan Medical School suggests the following: “Data from 80 focus-group participants suggested that the key influences on students’ development of humanism were their authentic, unique, and participatory experiences before and during medical school, and the opportunity to process these experiences.” We need medical schools to teach tomorrow’s doctors how to work with patients rather than flow charts. America, we can fix the over-medication, under-regulated, and over-priced pharmaceutical industry. We can live natural, healthy, and medication-free lives. We can prevent needless deaths.